R G Hamrick spearheaded the ‘High School Now’ Campaign in 1969 that successfully passed a $6.6 million bond issue for the construction of Alliance High School at its current location on Glamorgan Street. In addition, he campaigned at the State of Ohio for another $ 2 million by initiating a vocational education agreement with Marlington High School. Dr. Hamrick was superintendent of the Alliance City Schools from 1967 to 1981, coming from the Southeast Local School District as superintendent, principal in the Field Local School District and previously as a teacher. In all he worked in education for thirty five years. He served in WW II as a chief petty officer in the U S Navy. Born in Orma, West Virginia, Dr. Hamrick received his doctorate degree from Heed University. He was an active member of many professional and civic organizations, serving as president in 1974 of the Northeast Ohio Administrator’s Roundtable. Among his numerous honors, he was the 1969 Carnation Festival Grand Parade Marshal and 1988 Alliance Citizen of the Year. At his death on March 20, 1992, the Dr. R G Hamrick Memorial Scholarship Fund was established through Alliance High School. In 2006 this fund was transferred to the administration of the AHS Foundation. 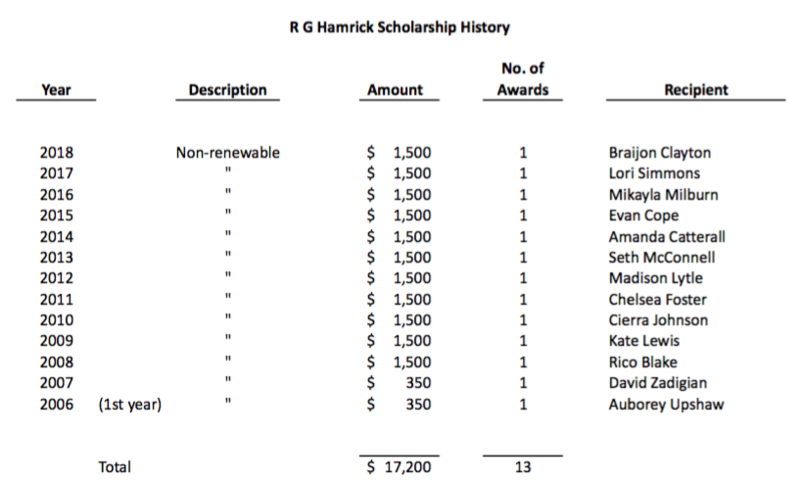 Since 2008, the Hamrick family has been contributing to the fund, increasing the Scholarship amount to $1,500.00 each year. Dr. Hamrick’s spouse, Jane O’Brien Hamrick, an elementary school teacher, died in 2013. His children Debby Hamrick Ulle ’71 lives in Painesville, Ohio, and son David Hamrick ‘74 lives in Clyde, Ohio.